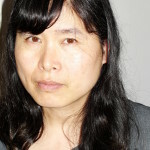 Elaine Woo is a poet/librettist and nonfiction writer. Her work is found in Arc Poetry Magazine, V6A, The Enpipe Line, Ricepaper, Shy: An Anthology, Megaphone Magazine and many other publications. Her first full poetry collection, Cycling with the Dragon is forthcoming from Nightwood Editions.